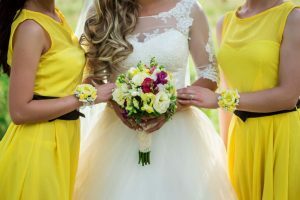 Olivia Petter has written an article collating just what couples to be or should be planning for 2019 to make their special day the wedding of the year. As summer typically denotes the end of the wedding season all that means is the start of planning for next years events. Having the odd pocket to be comfortable and keep confidence from waining looks to be the way its going. Also, that creature comforts around the dress design. So for example trains which are not too long so transition of wear throughout the day to be more seamless. As Rihanna said ‘Shine bright like a diamond; Well not so much about bright but definitely more colours – We are talking reds, pinks and even oranges to take a more prominent role in all things from bridesmaid dresses to floral arrangements. Going Eco is actually a thing that is spreading to all areas including a thought on the smaller details of a couples main event. From removing plastic to organic menus and flowers that can be replanted. This in a large part is being driven by Princess Eugenie who revealed that her wedding to Jack Brooksbank will be completely plastic-free. The use of drones being used by some couples has risen significantly in recent years. To get that money shot drones are great for taking memorable pictures and video at a height capturing not just a person but the ambiance of a wider scene. Going on your honeymoon BEFORE you get married !? Yes you read it here. It seems couples are indeed choosing to go away during their engagement rather than soon after we are calling them Mr. & Mrs. Apparently, weddings cost a tonne of dosh and after splashing out for the big day there may not be all that much left in the bank account to spend on a margarita and sun.